For the Irish conservative lobby group, see Cóir. Coir (/ˈkɔɪər/), or coconut fibre, is a natural fibre extracted from the husk of coconut and used in products such as floor mats, doormats, brushes and mattresses. Coir is the fibrous material found between the hard, internal shell and the outer coat of a coconut. Other uses of brown coir (made from ripe coconut) are in upholstery padding, sacking and horticulture. White coir, harvested from unripe coconuts, is used for making finer brushes, string, rope and fishing nets. It has the advantage of not sinking, so can be used in long lengths on deep water without the added weight dragging down boats and buoys. The name coir comes from kayar, a Dravidian word for cord, used in both Malayalam and Tamil, with neither language clearly proven to be the origin. Ropes and cordage have been made from coconut fibre since ancient times. Indian navigators who sailed the seas to Malaya, Java, China, and the Gulf of Arabia centuries ago used coir for their ship ropes. Arab writers of the 11th century AD referred to the extensive use of coir for ship ropes and rigging. A coir industry in the UK was recorded before the second half of the 19th century. During 1840, Captain Widely, in co-operation with Captain Logan and Mr. Thomas Treloar, founded the known carpet firms of Treloar and Sons in Ludgate Hill, England, for the manufacture of coir into various fabrics suitable for floor coverings. Coir fibres are found between the hard, internal shell and the outer coat of a coconut. The individual fibre cells are narrow and hollow, with thick walls made of cellulose. They are pale when immature, but later become hardened and yellowed as a layer of lignin is deposited on their walls. Each cell is about 1 mm (0.04 in) long and 10 to 20 μm (0.0004 to 0.0008 in) in diameter. Fibres are typically 10 to 30 centimetres (4 to 12 in) long. The two varieties of coir are brown and white. Brown coir harvested from fully ripened coconuts is thick, strong and has high abrasion resistance. It is typically used in mats, brushes and sacking. Mature brown coir fibres contain more lignin and less cellulose than fibres such as flax and cotton, so are stronger but less flexible. White coir fibres harvested from coconuts before they are ripe are white or light brown in color and are smoother and finer, but also weaker. They are generally spun to make yarn used in mats or rope. The coir fibre is relatively waterproof, and is one of the few natural fibres resistant to damage by saltwater. Fresh water is used to process brown coir, while seawater and fresh water are both used in the production of white coir. It must not be confused with coir pith, or formerly cocopeat, which is the powdery material resulting from the processing of the coir fibre. Coir fibre is locally named 'coprah' in some countries, adding to confusion. The fibrous husks are soaked in pits or in nets in a slow-moving body of water to swell and soften the fibres. The long bristle fibres are separated from the shorter mattress fibres underneath the skin of the nut, a process known as wet-milling. The mattress fibres are sifted to remove dirt and other rubbish, dried in the sun and packed into bales. Some mattress fibre is allowed to retain more moisture so it retains its elasticity for twisted fibre production. The coir fibre is elastic enough to twist without breaking and it holds a curl as though permanently waved. Twisting is done by simply making a rope of the hank of fibre and twisting it using a machine or by hand. The longer bristle fibre is washed in clean water and then dried before being tied into bundles or hanks. It may then be cleaned and 'hackled' by steel combs to straighten the fibres and remove any shorter fibre pieces. 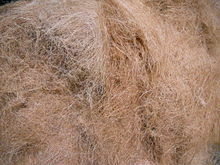 Coir bristle fibre can also be bleached and dyed to obtain hanks of different colours. The immature husks are suspended in a river or water-filled pit for up to ten months. During this time, micro-organisms break down the plant tissues surrounding the fibres to loosen them — a process known as retting. The Segments of the husk are then beaten with iron rods to separate out the long fibres which are subsequently dried and cleaned. Cleaned fibre is ready for spinning into yarn using a simple one-handed system or a spinning wheel. Researchers at CSIR's National Institute for Interdisciplinary Science and Technology in Thiruvananthapuram have developed a biological process for the extraction of coir fibre from coconut husk without polluting the environment. The technology uses enzymes to separate the fibres by converting and solubilizing plant compounds to curb the pollution of waters caused by retting of husks. Because coir pith is high in sodium and potassium, it is treated before use as a growth medium for plants or fungi by soaking in a calcium buffering solution; most coir sold for growing purposes is said to be pre-treated. Once any remaining salts have been leached out of the coir pith, it and the cocochips become suitable substrates for cultivating fungi. Coir is naturally rich in potassium, which can lead to magnesium and calcium deficiencies in soilless horticultural media. Coir fiber is rarely used as a potting material, except for orchids, and does not need buffering, as it has a very low cation-exchange capacity (CEC) capacity, hence not retaining salts. Coir does provide a suitable substrate for horticultural use as a soilless potting medium. The material's high lignin content is longer-lasting, holds more water, and does not shrink off the sides of the pot when dry allowing for easier rewetting. This light media has advantages and disadvantages that can be corrected with the addition of the proper amendment such as coarse sand for weight in interior plants like Draceana. Nutritive amendments should also be considered. Calcium and magnesium will be lacking in coir potting mixes, so a naturally good source of these nutrients is dolomitic lime which contains both. pH is of utmost importance as coir pith tends to have a high pH after some months of use, resulting in plant stunting and multiple deficiencies. Coir has as well the disadvantage of being extremely sensitive to the Leucocoprinus greenhouse fungus. The addition of beneficial microbes to the coir media have been successful in tropical green house conditions and interior spaces as well. However, it is important to note that the microbes will engage in growth and reproduction under moist atmospheres producing fruiting bodies (mushrooms). Bristle coir is the longest variety of coir fibre. It is manufactured from retted coconut husks through a process called defibring. The coir fibre thus extracted is then combed using steel combs to make the fibre clean and to remove short fibres. Bristle coir fibre is used as bristles in brushes for domestic and industrial applications. In agriculture and horticulture, coir is a substitute for sphagnum (peat moss) and peat because it is widely available and environmentally friendly. Many sources of coir however are heavily contaminated with pathogenic fungi, and the choice of the source is important. Coir is also useful to deter snails from delicate plantings, and as a growing medium in intensive glasshouse (greenhouse) horticulture. Coir is also used as a substrate to grow mushrooms. The coir is usually mixed with vermiculite and pasteurised with boiling water. After the coir/vermiculite mix has cooled to room temperature, it is placed in a larger container, usually a plastic box. Previously prepared spawn jars are then added, spawn is usually grown in jars using substrates such as rye grains or wild bird seed. This spawn is the mushrooms mycelium and will colonize the coir/vermiculite mix eventually fruiting mushrooms. Coir fibre pith or coir dust can hold large quantities of water, just like a sponge. It is used as a replacement for traditional peat in soil mixtures, or, as a soil-less substrate for plant cultivation. It has been called "coco peat" because it is to fresh coco fibre somewhat like what peat is to peat moss, although it is not true peat. Coir waste from coir fibre industries is washed, heat-treated, screened and graded before being processed into coco peat products of various granularity and denseness, which are then used for horticultural and agricultural applications and as industrial absorbent. Usually shipped in the form of compressed bales, briquettes, slabs or discs, the end user usually expands and aerates the compressed coco peat by the addition of water. A single kilogramme of dry coco peat will expand to 15 litres of moist coco peat. Coco peat is used as a soil conditioner. Due to low levels of nutrients in its composition, coco peat is usually not the sole component in the medium used to grow plants. When plants are grown exclusively in coco peat, it is important to add nutrients according to the specific plants' needs. Coco peat from Philippines, Sri Lanka and India contains several macro- and micro-plant nutrients, including substantial quantities of potassium. This extra potassium can interfere with magnesium availability. Adding extra magnesium through the addition of magnesium sulphates can correct this issue. Some coco peat is not fully decomposed when it arrives and will use up available nitrogen as it does so (known as drawdown), competing with the plant if there is not enough. This is called nitrogen robbery; it can cause nitrogen deficiency in the plants. Poorly sourced coco fibre can have excess salts in it and needs washing (check electrical conductivity of run-off water, flush if high). It holds water well and holds around 1000 times more air than soil. Adding slow release fertilizers or organic fertilizers are highly advised when growing with coco fibre. As a substitute for peat, because it is free of bacteria and most fungal spores, and is sustainably produced without the environmental damage caused by peat mining. Mixed with sand, compost and fertilizer to make good quality potting soil. Coco peat generally has an acidity in the range of pH - 5.5 to 6.5, which is slightly too acidic for some plants, but many popular plants can tolerate this pH range. Coco fibre can be re-used up to three times with little loss of yield. Coco fibre from diseased plants should not be re-used. Due to its superior absorption capabilities when compared to products made of clay, silica and diatomaceous earth-based absorbents, dry coconut coir pith is gaining popularity as an oil and fluid absorbent. Many other absorbents have to be mined, whereas coconut coir pith is a waste product in abundance in countries where coconut is a major agriculture product. Coconut coir pith is also used as a bedding in litter boxes, animal farms and pet houses to absorb animal waste. Coco fibre can harbour organisms that pose a threat to the biosecurity of countries into which it is imported. Coco peat has been imported into New Zealand since about 1989 with a marked increase since 2004. By 2009 a total of 25 new weed species have been found in imported coco peat. The regulations relating to importing coco peat into New Zealand have been amended to improve the biosecurity measures. Trichoderma is a naturally occurring fungus in coco peat; it works in symbiosis with plant roots to protect them from pathogenic fungi such as Pythium. It is not present in sterilised coco peat. Total world coir fibre production is 250,000 tonnes (250,000 long tons; 280,000 short tons) This industry is particularly important in some areas of the developing world. India, mainly in Pollachi and the coastal region of Kerala State, produces 60% of the total world supply of white coir fibre. Sri Lanka produces 36% of the total brown fibre output. Over 50% of the coir fibre produced annually throughout the world is consumed in the countries of origin, mainly India. Together, India and Sri Lanka produce 90% of the coir produced every year. Sri Lanka remains the world's largest exporter of coir fibre and coir fibre based products. Chisholm, Hugh, ed. (1911). "Coir" . Encyclopædia Britannica. 6 (11th ed.). Cambridge University Press. p. 654. ^ "coir | Origin and meaning of coir by Online Etymology Dictionary". www.etymonline.com. Retrieved 20 April 2018. ^ "the definition of coir". Dictionary.com. Retrieved 20 April 2018. ^ a b Staff. "About Coir". Coir Board, Govt. of India. Archived from the original on 25 February 2012. Retrieved 17 March 2013. ^ "Thomas Treloar 1818-1876". RootsWeb. Archived from the original on 2017-12-12. ^ "'Clean' technology for coir fibre extraction". The Hindu. 2009-04-30. Archived from the original on 2012-11-08. ^ Hunt, Robert; Ricciardi, Zac (2011-02-10). "Reusing Media: Coco Coir". Urban Garden Magazine (14). Archived from the original on 2013-02-04. ^ The Complete Book on Jute & Coir Products (With Cultivation & Processing). ISBN 978-9381039625. ^ "Nasobronchial Allergy and Pulmonary Function Abnormalities Among Coir Workers of Alappuzha" (PDF). Japi.org. Archived (PDF) from the original on 2012-09-15. ^ "Reptiles". 16. Fancy Publications. 2008: 66. ^ Jacobi, Michael (2011). Tarantulas. TFH Publications Inc. p. 93. ISBN 9780793844784. Archived from the original on 2017-07-10. ^ a b Mason, John (2003). Sustainable Agriculture. Landlinks Press. pp. 192–. ISBN 978-0-643-06876-6. Archived from the original on 10 July 2017. Retrieved 14 May 2015. ^ "Coco peat/Coir fibre". MAF Biosecurity New Zealand. 17 March 2009. Archived from the original on 3 June 2010. Retrieved 30 October 2010. ^ The Complete Book on Jute & Coir Products (with Cultivation & Processing). Wikimedia Commons has media related to Coconut fibres. Look up coir in Wiktionary, the free dictionary. "Coir" . New International Encyclopedia. 1905.